Tag Archives: Thomas S. Kelso Ph.D. These satellites had been routinely tracked and estimates were that they would pass at a distance of 584 meters (1,916 feet). Cosmos 2251 (Космос-2251) was a Strela 2M military communications satellite. It had been launched from Plesetsk, Russia, at 04:20:00 UTC, 16 July 1993, but was no longer active and was not controlled. The satellite weighed approximately 900 kilograms (1,984 pounds). It was in a 783 × 821 kilometers (486.5 × 510.1 miles) orbit, with an inclination, relative to Earth’s axis, of 74.0°. It completed one orbit every 1 hour, 41 minutes. Iridium 33 was commercial communications satellite which was launched from the Baikonur Cosmodrome, Kazakhstan, at 01:36:54 UTC, 14 September 1997. It was built by Lockheed Martin for Iridium Satellites LLC. weighed 1,234 pounds (560 kilograms). Iridium 33’s orbit was 522 × 541 kilometers (324.4 × 336.2 miles). 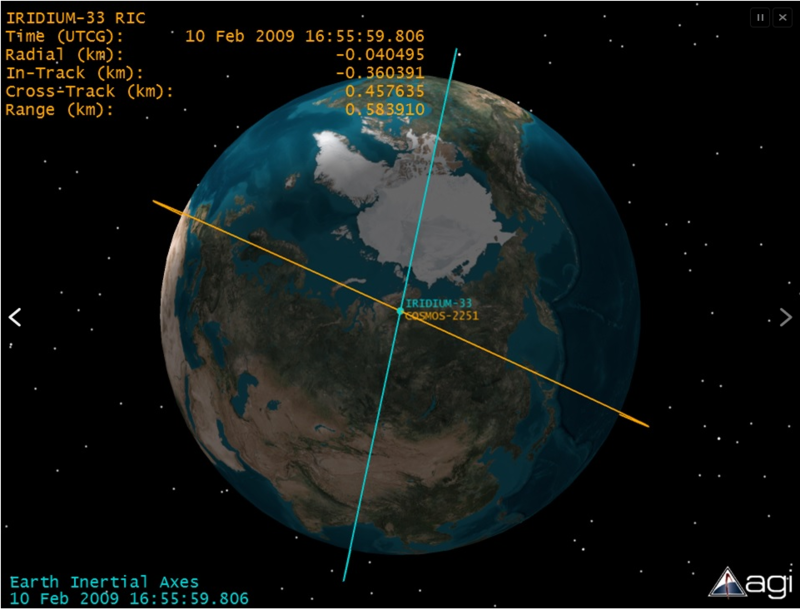 It had an orbital inclination of 86.6° and orbited the Earth in 1 hour, 34.9 minutes. Subsequently 406 pieces of Iridium 33 and 960 pieces of Cosmos 2251 were tracked as they spread in orbit. While some of the debris has re-entered the atmosphere, perhaps 50% of the total remains in Earth orbit.